Leather Refinisher & Color Restorer (LRCR) meets and surpasses this criteria. 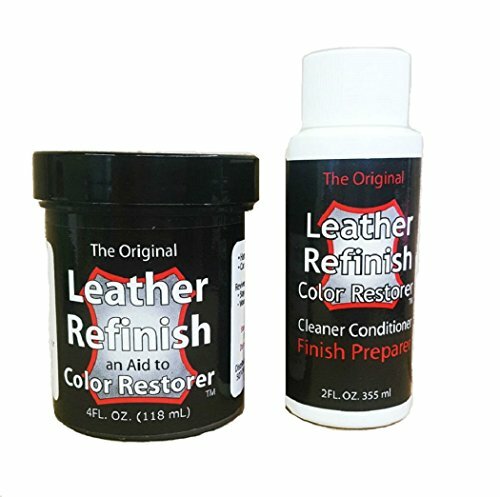 Leather Refinisher & Color Restorer is a heavy liquid much like thin syrup and is applied with a soft cotton cloth. It dries to the touch in about five minutes. There is no need to mask off metal hardware. Leather Refinisher & Color Restorer wipes off easily with a damp cloth without staining. An easy to use Leather Refinisher designed to "Do it Yourself" which is extremely flexible & will not rub off on clothing. For best results follow these steps. 1. Chose the color of Leather Refinish Color Restorer you need (see color chart, and samples are available below). 2. Use Leather Refinish Color Restorer Cleaner Conditioner to thoroughly clean and prepare the surface for coloring. We formulated our black, dark brown and navy colors to match those used by COACH and Stone Mountain because these two brands comprise the majority of handbags we refinish. These three popular colors are also a perfect match to BIRKENSTOCK sandals which often need refinishing. Refinishing leather is messy, time consuming, expensive and hazardous to your health. Well not anymore! The name of our product is Leather Refinisher & Color Restorer or as our customers refer to it as "that miracle product". We have been in the leather dyeing and refinishing business for twenty-eight years. Because refinishing leather professionally is expensive the majority of our customers were looking to buy a product and do it themselves. If you have any questions about this product by Leather Refinish, contact us by completing and submitting the form below. If you are looking for a specif part number, please include it with your message.